Is Node.js an apt approach for enterprise app development? Complex enterprise apps need to be able to track business performance, help employees stay connected, store confidential data safely, track employee performance and do a whole lot more. Corporate users of Node.js include large organizations such as GoDaddy, Groupon, IBM, LinkedIn, Microsoft, Netflix and Walmart. Undoubtedly, enterprise app developers need a very robust language to develop an enterprise app. Does Node.js fit the bill? The best option is to partner with a Node.js development company to gain optimum performance. Node.js offers a voluminous NPM registry with 190,000+ modules, and more being added every day. Available on GitHub, these open source modules can help developers to modify and build custom Nodejs applications. This flexibility encourages developer creativity and also of course, enriches their experience and increases developer satisfaction. It also facilitates code-sharing amongst team members, without giving away business logic publicly. When the Web developers have to worry less coding glitches and roadblocks, they can devote time on aligning with business logic, increasing overall productivity and efficiency. Every project begins with on a small scale. Microservices makes it easy to handle teams and separate codebases, allowing you to handle multiple teams, resulting in a much faster development. Node.js makes it easy to manage teams located in different geographies, with several tools NPM offers. But as the project continues to grow, gaining new features, increasing user base, it is important to have development team that can cope with constant evolution. Even before you realize, you may end up with a huge project which might become a daunting task that your development team struggles to cope with. You will probably need to add new functionality and features while still providing excellent performance to your users. But as it gets more and more complex, introducing new changes becomes a nightmare. The problems associated with enterprise applications involve all the complexity, the app often becomes difficult to handle, the deployment becomes a real pain, and the whole team gets too big to coordinate their work in an efficient manner. The solution to such problem is microservices pattern. Microservice basically means a single self-contained unit which along with other components, makes up a large application. By splitting your app into small units each and every part is deployable and scalable, as well as can be written by different teams and in programming languages. Apps can be tested individually. Smaller teams are much easier to work with, plus, you don’t have to deploy the whole codebase every time you want to introduce some change in one part of your app. Several well-known enterprise-level companies have already embraced the power of Node.js and microservices, a perfect combination for better performance, less code, and efficient deployment. Restful APIs makes enterprises agile and allows them to focus on speeding application development. The key is developing large-scale applications with reusable RESTful APIs. It does this with the help of APIs that can handle large volumes of data by connecting to the backend, keeping things lightweight and efficient. There has been a lot of discussion about whether Node.js is the apt choice for enterprise app development. But when things change for the better, it is a good decision to adapt to the change. The only way to find out whether NodeJs works for your enterprise or not is based on your business goals and requirements. Once you understand what Node.js has to offer to enterprise app development, give it a try. 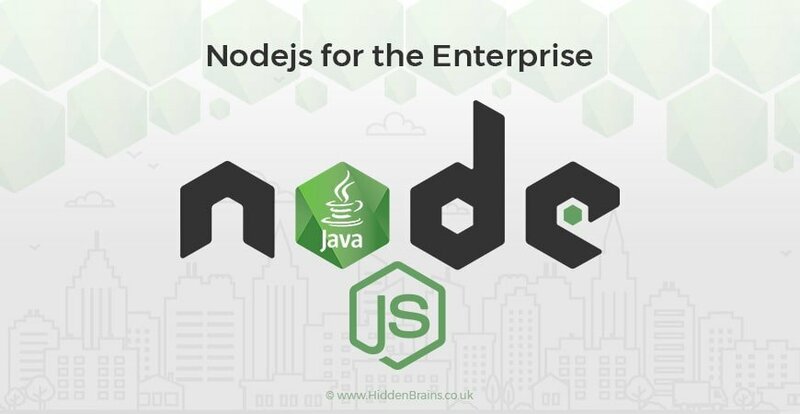 Want to develop Node.js apps for your enterprise? Get in touch with our team.